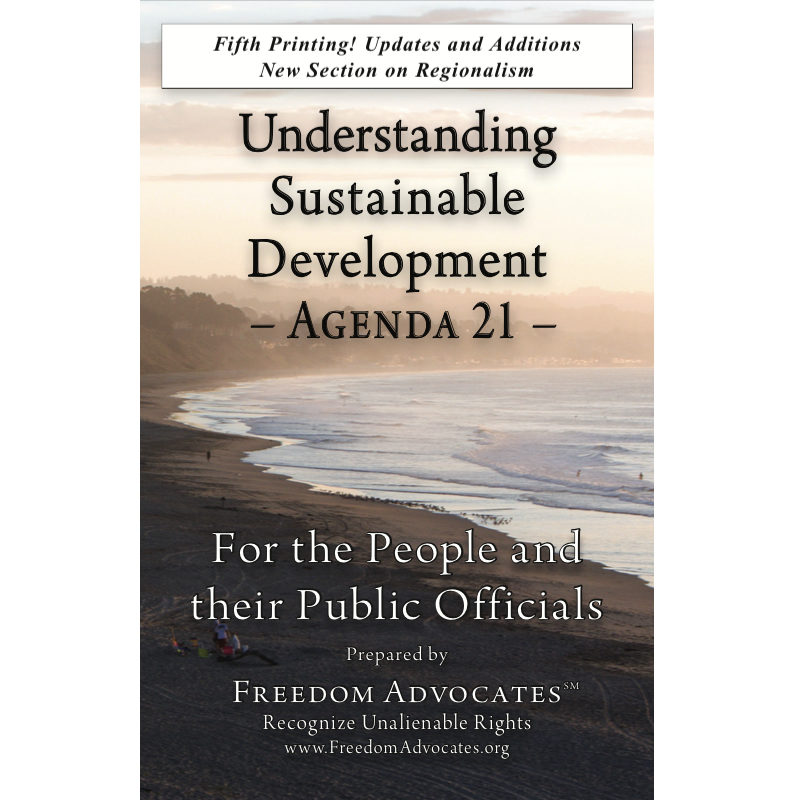 In communities across America, “stakeholder” councils are being formed, or have already been formed, to advance Agenda 21 to transform cities and towns into “sustainable communities.” The “consensus process” is used to gain the appearance of public support for the principles of sustainability, applied to a particular community. The process is designed to take the public policy- making function away from elected officials and place it in the hands of non-elected officials, while giving the appearance of broad public input into the decision-making process. Stakeholder councils are called by many names and are created for a variety of specific purposes. Whatever they are called, and whatever the stated purpose for which they are created, they all have several common characteristics, and all have a common objective: the implementation of some component of Agenda 21. While each community may experience a variety of different approaches, it is necessary to recognize the common principles that guide all such councils. The general objective of all stakeholder councils is to promote three primary values: environmental protection, equity, and sustainable economic development. To promote these values, a comprehensive “community” plan must be developed which links, or “integrates,” all three values. In some communities, stakeholder councils are formed to work on a single component of a comprehensive plan that is to be combined with the work of other councils that may be working on different components in different geographical areas of the same community. The various councils may or may not know about the work of other councils that is underway simultaneously. Currently, the most common stakeholder councils are related to the “visioning” process to create “Sustainable Communities;” Ecosystem Management Plans, Heritage Area or Corridor Plans, River Protection Plans, Biosphere Reserves, and Economic Renewal Plans. Almost always, the plan will encompass more than one political jurisdiction. In some instances, several counties and states may be included, as in the case of the East Texas Ecosystem Plan, which embraced 73 Texas counties and a small portion of Louisiana. In other instances, the plan may be confined to a single county or city. When a plan focuses on a single town or county, someone, somewhere, is planning to incorporate that plan into a multi-jurisdictional plan. The stated purpose of the stakeholder council may be related to environmental protection only, which is usually referred to as natural resource management. It could be related to any one of several other single subjects such as economic renewal, education, emergency response, or transportation. Or, the stated purpose could be to develop a comprehensive plan that addresses all the issues. Whatever the stated purpose, it will attempt to integrate environmental protection, equity, and sustainable economic development. Stakeholder councils do not simply appear. Nor are they formed as the result of citizen response to a common problem. Someone creates them — with great care. They could be formed by a government agency, or by several government agencies working together; they could be formed by NGOs (non-governmental organizations) or by a combination of government agencies and NGOs — which is often the case. The Environmental Protection Agency and several other federal agencies offer grants to NGOs and local government agencies as incentives to create these councils and develop plans to achieve sustainable communities. Whoever instigates the process will carefully select individuals from the community to participate in a meeting, which will evolve into a series of meetings. The individuals selected will be chosen because they are known to share philosophical objectives, and to represent broad segments of the community. The poor, disabled, indigenous populations are specifically targeted. Representatives from government agencies are also targeted. Typically, at least one elected official from each of the political jurisdictions in the plan area are invited. Someone from industry, and a landowner or two are also among those invited. Formation of the original group is extremely important. People who support the objectives of the originators must dominate the group. There also has to be an appearance of broad community representation. The original group may be quite small, or it could be quite large, depending upon the objectives and the size of the community and the plan area. The initial meeting is rarely advertised. Participants are invited personally, and frequently hold several meetings before the press or the community is ever informed. By the time the public becomes aware of the existence of the stakeholders council, it is pretty well organized and its work is well underway. The Consensus Process — often called “collaborative decision-making” — is a process that begins with a predetermined outcome. The agencies or NGOs that assemble an Ecosystem Management visioning council, intend to establish an ecosystem management plan. The originators know what they want included in the plan before the first meeting is ever scheduled. Those who assemble Sustainable Community visioning councils intend to establish a plan to achieve their vision of a sustainable community. The literature will say that broad community input is sought. In reality, the outcome has been decided before the first meeting begins; the real purpose for the process is to “educate” the participants. conflict and confrontation between and among differing views. The facilitator leads the discussion with questions that are skillfully crafted to elicit no response. Questions are framed to force respondents to disagree with a statement with which most reasonable people would agree. For example, a facilitator might ask: “Is there anyone who would disagree that we have a responsibility to leave future generations sufficient resources to meet their need?” Obviously, no reasonable person can disagree with such a statement. Silence — no response — implies that a consensus has been reached on the need to protect resources for future generations. The example is an oversimplification, but it illustrates the technique used by the facilitator. even more extreme question, such as: “Surely you are not telling this group that you feel no responsibility to your grandchildren, are you?” With such tactics, one who objects or disagrees very often is quickly labeled as a troublemaker and is either ignored or excluded from the group. Eventually, a professional will write a report. It will be “The Plan,” or the document produced by the group. Regardless of what the group’s stated purpose may be, the final document will include language that says the plan is designed to integrate ecology, equity, and the economy; environmental protection, equity, and sustainable development. The players will include federal, state, and/or local government appointed officials. Working hand-in-hand, there will also be one or more representatives from NGOs that may or may not be recognizable. The Nature Conservancy and the Sierra Club are two of the more active NGOs instigating these stakeholder councils. Frequently, however, a new NGO will be created expressly for the purpose of instigating a stakeholder council in a given community. One or more of the larger NGOs, or an organization such as the Tides Foundation, will supply the start-up money and send a couple of professionals into a community to create an NGO such as “Friends of Hollow Rock, Inc.” or something similar. Sometimes an existing local NGO will be used, with substantial financial and leadership help from a larger NGO, or with help from the federal government through one of the many grants that are available for the purpose. Whenever it is possible, a well-known local figure — a politician, businessman, or landowner will be created to be the spokesperson. In Racine, Wisconsin, no less a figure than Samuel C. Johnson, CEO of Johnson Wax Company was chosen to convince his neighbors that sustainability was the only way to go. Such individuals give credibility to the process and can have enormous persuasive power over local residents. across the countryside of America. Those who recognize the inherent dangers in allowing non-elected bureaucrats to develop public policy, and those who can see the socialistic underpinnings of a managed society in the objectives of Agenda 21, need to rise to the occasion to stop the underpinning of the United States Constitution. Henry Lamb has a comprehensive archive totaling more than 2,000 pages and accumulated since 1994, located at Sovereignty International’s Library. For more information on the consensus process please see How to Handle Predetermined Consensus Meetings: Let’s Stop Being Manipulated! The Delphi Technique by Albert V. Burns. Sustainability Agendas push words and programs that sound good, but are not. Here is a pamphlet for you and/or your elected representatives that explains things. See the full PowerPoint Gallery here. See the Freedom Advocates Cartoon Gallery here.